Mutually converts SDI and HDMI. This converter can embed external sounds and extract the embedded audio. Has internal frame buffer, supports frame rate conversion and external synchronization. Supports any type of format conversion. 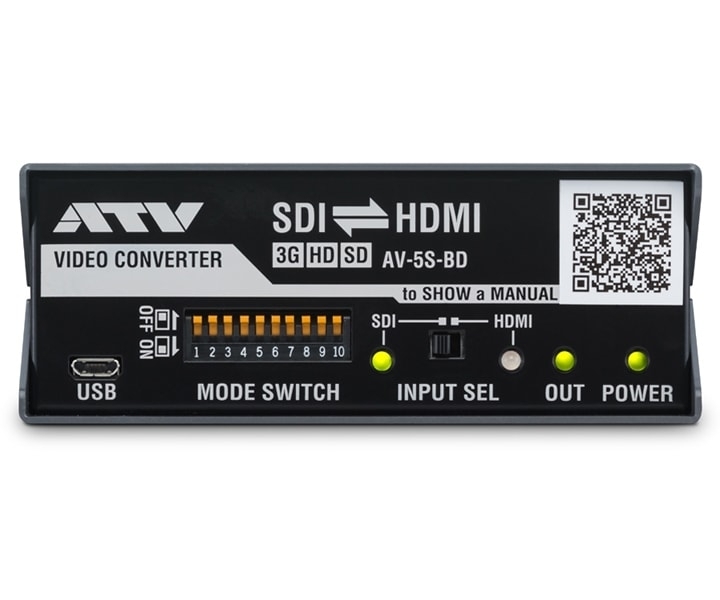 The AV-5S-BD can convert between HDMI and SDI in either direction. Though compact, the model provides good support for high-end use. This unit can output the same throughput (loop through output) or internal processing to match an incoming signal and so is also usable as a dual system signal distributor. The mission of the converter is to convert only the signal format and output a signal completely identical to the input source. 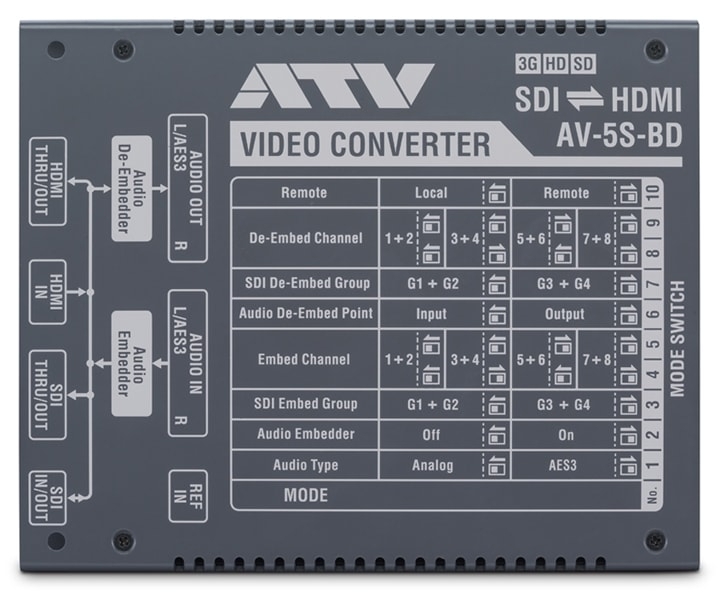 The AV-5S-BD gives complete conversion with no clipping and that suppresses video signal deterioration to extreme limits, until a super black of 0 IRE or less and a super white of 100 IRE or greater is reached. The linearity of the color spaces is also of course maintained. Supports input and output rates of 480i, 720p, 1080i, 1080p, 2K (2048 x 1080). It also of course correctly recognizes 23.98p and 24p, 29.97p and 30p, 59.94p and 60p and can even convert P (Progressive) and PsF (Progressive segmented Frames). The AV-5S series can embed external 2-channel analog or AES3 digital audio signals into video signals and output them. Conversely, it can also de-embed audio that was embedded into video signals, and extract it as 2-channel analog or AES3 digital voice signals. The voice group or channel No. can be designated for both embedding and de-embedding. This series has an internal frame buffer function in addition to a low-delay direct conversion mode. In order to avoid potential signal delays, many converters usually don’t include frame buffers. However the AV-5S series to the contrary, achieves frame rate conversion by way of an internal frame buffer. Further, even if the video signal is cutoff, output of a black or frozen final frame can be selected. Yet another function fades-out the audio in a minimum 1 frame and fades-in when restoring. On the other hand, a direct conversion mode to hold delay to a minimum is also included. 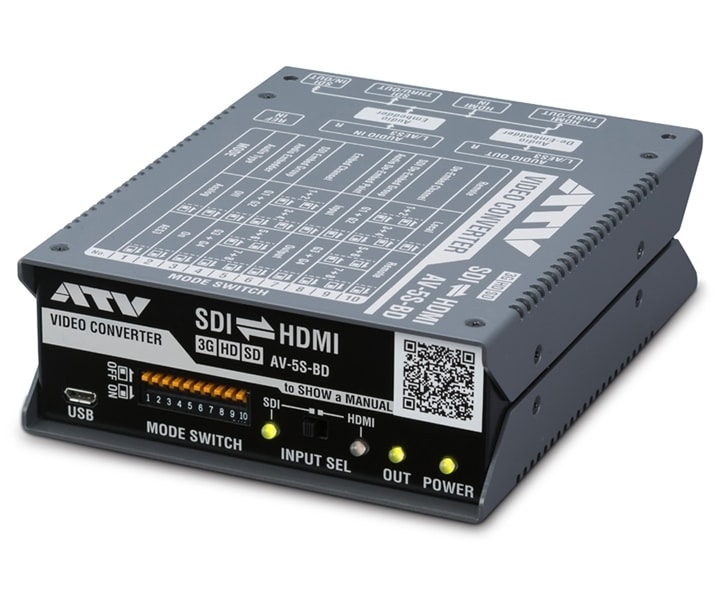 The AV-5S series includes a reference input (REF IN) for GENLOCK for synchronizing to other sources. In cases where a digital single-lens reflex camera that can't input external sync is incorporated into the system, REF IN can also be used as a frame synchronizer as well as for format conversion. The AV series is designed to fit within a 1/4U rack side width and 1U rack size height. A maximum of 4 units can be mounted within 1U rack size and the screw holes in the rear section can also be used to mount it onto a wall. The upper and lower cover overhangs of the rear panel can reduce impacts or unwanted contact with the connector section. 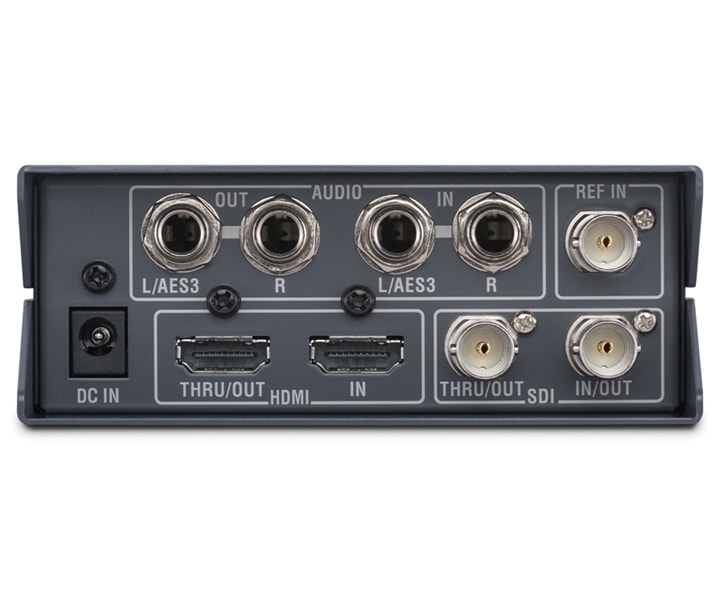 Users can make more detailed parameter settings from the software by making a USB connection to this unit from a PC or Mac rather than just using the front panel dip switches. Parameters can be loaded and saved as files and can be instantly changed to match the usage site. Moreover, using a USB hub allows batch management of multiple AV series parameters. Control software for these tasks can be downloaded at no cost from the ATV official site. The specifications and/or appearance of this unit are subject to change without prior notice.